Time is fleeting. We all know this just as we know time is the one thing you can't get more of. What then, would you do if you were granted an eternity? As with almost everything in life the speculation of possibilities is always greater than the reality and it turns out the same would be true of immortality, at least according to Adaline Bowman (Blake Lively). While these are the big questions posed in the film, what makes it all the more fascinating (as with any film spanning generations) are the dealings in where we're going and where we've been and who we are because of it. Adaline has a perspective that will forever go unmatched and because of that she finds it hard to connect with anyone in the present world, much less those who are the age she continues to look. With that mindset it is her observations that I, personally, would find to be the most interesting aspects to come out of this curse disguised by a blessing in vanity. This is highlighted in sort when we are treated to Adaline never encountering anything new, but instead always having a history to reference; even in something as seemingly insignificant as a park bench. The weight of contemplation, the effects of time never slowing down and the regret that will forever tinge our minds if we continue to in fact contemplate it all rather than experience our actual life seep into the consideration of what we would do were we in Adaline's position. Such lines of thought would seemingly make the exploration of having a power over time the most engrossing and while Adaline certainly hints at such themes, the main narrative ends up focusing on the one guy that is able to diminish our titular characters extensive perspective enough to make her love him. This looked to be a problem given the high concept would inevitably be squandered on a typical love story, but the larger ideas of how old we are not dictating who we are come through well enough that I can't complain too much. 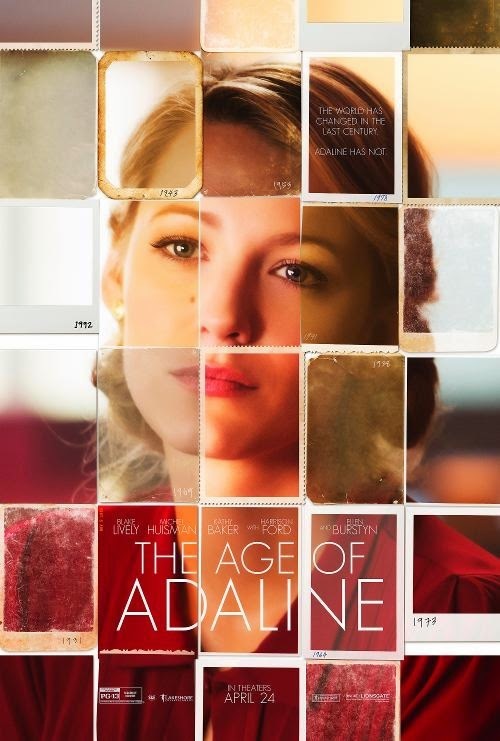 Flemming (Ellen Burstyn) consults her mother, Adaline (Blake Lively), over the quality of her extended life. While I wasn't sure what to expect I came away from The Age of Adaline more impressed than disappointed given how expertly the film was able to purport an intentioned throwback to what made movies so attractive in the first place by incorporating not only a big Hollywood romance, but the key era of that Hollywood golden age into its DNA. We are speedily introduced to Lively's Adaline as narration that sounds suspiciously close to Brad Pitt's in The Curious Case of Benjamin Button recounts her life so far. This is, of course, up to the point in 1933 when she is involved in a life-threatening car accident that instead of killing her magically (though desperately attempted to be explained logically by screenwriters Salvador Paskowitz and J. Mills Goodloe) makes Adaline ageless. While she of course doesn't realize the effects immediately Adaline comes to understand that her life and her mentality is changing despite the fact her outward appearance is not. By the time Adaline reaches her mid-forties and signs of her unchanging appearance become obvious even to others given she now looks the same age as her daughter, Flemming (Kate Richardson), she comes to the decision big life changes have to be made. In coming to this conclusion, especially after a run-in with the FBI that is unfortunately not explored further than one scene, Adaline decides to never allow herself to get close to anyone again and to move and change her name and address every decade. She never reveals her secret to anyone outside of Flemming (as played by Ellen Burstyn in the main narrative) and when we come to meet her in present day San Francisco she is preparing to pick up and move once again. Despite things seeming to go smoothly Adaline is doing little more than existing in fear rather than actually living an extended life. That is, until a chance encounter with charismatic philanthropist Ellis Jones (Michiel Huisman from Game of Thrones) reignites a passion not only for romance, but for life. In not really being able to discuss the events of the second half of the film in fear of spoiling anything it makes it somewhat difficult to further dissect the film. And so, with that in mind we'll bring attention to the aspects of how director Lee Toland Krieger (whose Celeste & Jesse Forever I really enjoyed) took this fairly outlandish tale and made something that comes across as rather regal and thoughtful despite it being a premise that could have easily come off as silly. The thing that's even more gratifying about the film than this though is that Krieger not only elevates the tone to something we don't just take seriously, but even further to the point of emotionally resonant. While much of this may be attributed to Lively's performance as I was probably most surprised by how elegant the actress came off given I've only seen her in Accepted (2006) and Savages (2012) if you're not counting her small supporting role in The Town. Whereas it is easy to see her as someone quickly adjusted to a life of ease based on little more than her glamorous exterior I imagine she took this role to divert those expectations all the more and pointing to the bold fact there is more to her than her beauty. To say all of this is to say that not only does Lively's portrayal of a rather conflicted woman ring increasingly sincere when the reality of her situation is more daunting than anyone on the outside looking in would give it credit for, but she communicates it all exceptionally well. Most would be eager to take Adaline's spot and view retaining their youth as nothing short of a miracle, but this is where that perspective again comes into play. It's not that Adaline has fallen into a routine that makes forever feel like a boulder, but that she has never been afforded the opportunity to create a routine at all. Lively conveys each of these heavy attributes surrounding her circumstances with an earnest fashion masked by her genuine smile that gives off the perfect balance of being thankful for the gift of experiencing all she's had the opportunity to see while hiding the downsides of such a struggle. William (Harrison Ford) is struck by how similar Adaline looks to a girl he once knew. What Krieger does in the mean time, building around his nuanced and impressive lead performer, is allow his cinematographer David Lanzenberg (The Signal) to coat the film in an aged aesthetic that puts the San Francisco-set film in a constant state of dreary fall with a sense of grandeur. There are always lovely peacoats to be worn and scarves aplenty to decorate the actors as much as the resplendant library building wherein much of the first act takes place with the second reverting to more of a noble countryside estate. Within both the settings and the actors on screen there is a specific tone that resembles something majestic. There is nothing to necessarily disrespect about the film because it clearly knows what it is going for and uses the right tools in order to execute those desires to great effect. It is a film that looks as beautiful as it does make you reflect on your own available time and try to find appreciation in how little of it we actually get in the big scheme of things. That may sound a little heavy-handed given the quick synopsis for this would consist of Lively getting entangled with a pretty boy while trying to deal with an internal conflict, but props to both Krieger and his cast for really selling it, because it ends up working rather well. It's the little things both in life and in this film that make it memorable; it's not all about the broad strokes and Krieger uses that to his advantage often. Making the little moments in the relationship between Adaline and Huisman's Ellis is another driving force that make the film so readily accepted. Not being familiar with Huisman at all it isn't hard to come to understand why Lively's Adaline might find it difficult to resist his charm given he never comes on too strong, never makes grand gestures or does anything out of the norm, but confesses an attraction purely based on the type of person Adaline portrays herself to be with her beauty only an added bonus. We respect Ellis' intentions and therefore root for both him and for the relationship at the heart of the film. It should also be noted that Harrison Ford does some of his better work in a strong supporting role while Anthony Ingruber does a fine Ford impression circa A New Hope. With that, The Age of Adaline still feels bigger than what it actually delivers while its execution lends a sense of scope its story doesn't necessarily carry. Still, its strengths mostly make up for its shortcomings and in the end it hits the right spots enough to leave you satisfied.